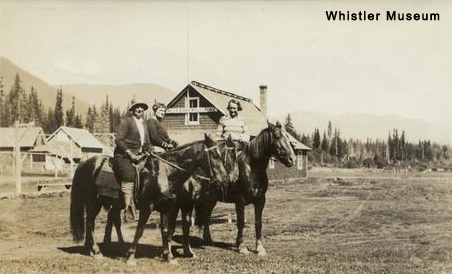 It has long been known that Rainbow Lodge (Whistler’s first resort lodge) was a tourist destination based around fishing. What many people don’t know is that fishing wasn’t proprietor of Rainbow Lodge Myrtle Philip’s only hobby. She also enjoyed spending much of her leisure time with some tall, dark, and four-legged creatures. Myrtle and two other women on horseback at Rainbow Lodge, ca. 1925. In the background, Alta Lake Post Office and Store can be seen. Alex and Myrtle Philip first opened Rainbow Lodge in 1914. This was the same year the Great Pacific Railway (PGE) reached Alta Lake (now Whistler), making the valley much more accessible to the outside world. Tourism in the area took off and by the 1930s, Rainbow Lodge had expanded to include 45 outbuildings in addition to the lodge. 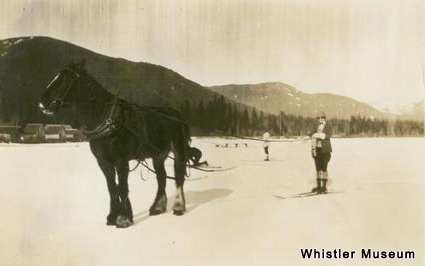 Prior to the development of the PGE, horses played an integral part in the two-day hike from Squamish to Alta Lake. From 1858 onward, explorers sent by British Columbia Governor, James Douglas, used sturdy pack horses to carry supplies along the Pemberton Trail for trappers and prospectors looking for their fortunes in the Coastal Mountains. Settlers in the Alta Lake area also made use of horsepower for the purpose of clearing land, hauling firewood and hay, and towing newly cut timber down the mountain trails, often for two or three miles at a time. Myrtle enjoyed taking her horses along various trails, particularly those that ran along Alta Creek (pictured here) and Green Lake. Myrtle Philip was a devoted horseback rider, and she took great pride in her horses and stables. 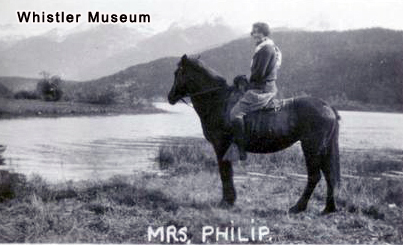 Horses provided recreational enjoyment for the newly discovered summer tourist trade in the 1920s, 30s, and 40s, and Myrtle assisted in the development of horseback riding as a tourist option, implementing regular early morning breakfast treks on horseback to Green River for the guests of Rainbow Lodge. Midnight rides, makeshift racetracks, and gentle walks through the valley trails were all enjoyed by visitors to Alta Lake. The Rainbow Lodge workhorse, Bob, would even tow skiers and skaters behind him across the frozen lake in the wintertime. “I think, really, that riding was one of the most popular things at Rainbow Lodge and it is regrettable that at this point, there is so little of it done”, Myrtle affirms in an interview done in 1971. For those that remember Rainbow Lodge, snapshots of horses grazing and morning trail rides make up a large part of these memories. the Rainbow Lodge workhorse, 1924. While horseback riding is still available to summer visitors to the vicinity today, particularly in the Pemberton area, mountain biking has become the main outdoor activity of choice in the summer months and many buildings that previously served as stables are now replaced by bike rental and repair shops. Several companies offer scenic trail rides through areas such as the Lilloeet River and Callaghan Creek, as well as day trips to Birkenhead and Tenquille Lake. Though horseback riding will likely never be as popular as skiing and mountain biking in Whistler, it remains a hobby, passion, and sometimes even career for those who love it. 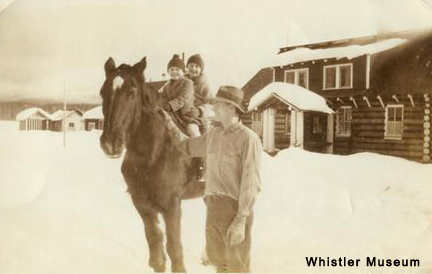 Skijoring (being towed on skis behind a horse or dogs) was a popular winter activity for the guests of Rainbow Lodge in the late 1920s and 1930s.